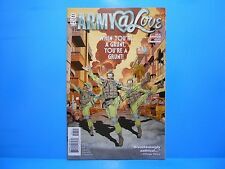 Army @ Love lot of 2 comics #1 & #2 2007 Rick Veitch DC / Vertigo Comics VF/FN . Army At Love (DC Vertigo 2007) Issues 1-6 Set Lot Run! Rick Veitch! All NM! This page was last updated: 18-Apr 11:47. Number of bids and bid amounts may be slightly out of date. See each listing for international shipping options and costs.